Wow. I get a crazy number of questions each week regarding this "gluten-free" diet craze. I'm not sure why some diets become a "fad" and some don't, but because so many patients ask me about them, I have to stay up to date to be able to properly inform them. 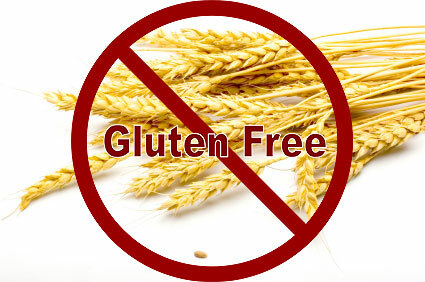 So, here is my take on the dieting fad of 2012, the Gluten-free diet. First, let's talk about what gluten is. Gluten is a protein found in wheat, rye, barley and a few other grains. It is found naturally in these grains, and is what gives bread structure, strength and the "chewy" property. Because of this, gluten is also used as an additive to make other items thicker, for instance "fake" meats that vegetarians eat a lot of the time. Gluten is also the item in bread that makes it rise, as gluten retains gas when baked, thus causing the "fluffiness". So, what's with the gluten-free diet? So, because of these chewy and thickening properties, some people have a difficult time digesting gluten. There are some people who have an allergy to gliadin (Celiac Disease), which helps to form gluten. These people have a MEDICAL reason not to eat gluten, simply because they have an allergy to it. When these particular people eat a food with gluten, they produce an immune response which interfreres with the absorption of food. They may have diarrhea, weight loss, and lack of ability to absorb vitamins and minerals in the intestines, causing anemia and some vitamin deficiencies. Also, some people have a gluten allergy and most patients with a skin condition known as dermatitis herpetiformis are told to remain gluten-free as it is known to trigger the skin condition. From a nutritional and medical standpoint, I do not see a reason to avoid gluten unless you are told to do so by a physician. Gluten, and wheat provide a major source of vitamins and minerals to a balancesd diet. Many gluten-free diets do not have the same amount of nutrients such as folate, iron, calcium and fiber than other foods. Gluten is found in a lot of processed foods because it is used as a thickening agent. So, going "gluten-free" to avoid processed foods is great. BUT, going gluten free also deprives people of whole-grains like wheat bread and pasta which are full of vitamins, minerals and proteins. So, lets stick to "processed- food free" and not "gluten-free". I do not agree with a strict gluten-free diet for reasons stated above, but I am a HUGE fan of fresh, whole foods and not processed foods. Once again...a well-balanced diet is typically better than any fad diet out there! P.S. Don't fret...next year I will discuss the fad diet of 2013!